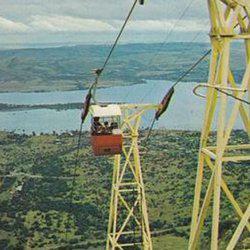 The fun doesn’t begin and end with the cable car ride itself. A trip to the top of the mountain will quickly turn into a day of enjoyment away from the pressures of city life. Sit back and watch the paragliders or relax in the grass and admire the view while enjoying a picnic basket that has been packed for you. 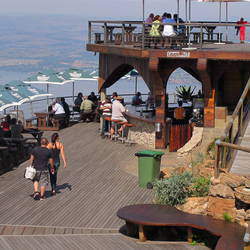 There is the Express restaurant and a Pizza Shack at the top of the cableway. Enjoy a meal or sip on a cocktail at the bar while admiring the view from the terrace. Shaded picnic tables are provided which allow you to watch your children play on the jungle gym in the Kidzone play area. You can do some shopping at the Little Shop at the Top, or just sit back and enjoy nature, taking in the tranquility and the calls of birds. You may well be lucky enough to see some endangered vultures circling overhead, from the nearby vulture sanctuary or explore the mountain by way of the 1km Dassie Loop walkway. Informative signs along the way explain points of interest that you can see from atop the mountain. 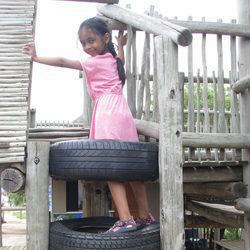 For the more adventurous we offer paragliding and abseiling. On a clear day you can see the Coca-Cola Dome in Northcliff, Johannesburg, most of Brits and even some of Pretoria. 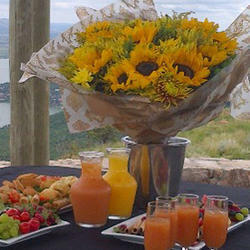 The Harties Cableway is a fun venue for special functions. 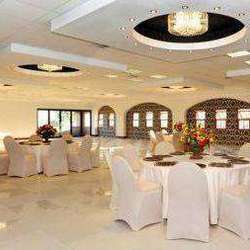 Our facilities can cater for a variety of events, including weddings, conferences, matric dances and smaller events, such as an especially romantic date (many have chosen to propose atop the mountain surrounded by breathtaking views). The sophisticated yet intimate cable cars each seat six people, and arrangements can be made to have champagne on ice in each car as guests ascend the mountain. 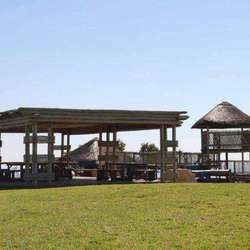 Although the Harties Cableway usually closes before sunset, for special events on weekends, arrangements can be made for it to remain operating, especially for your function so that guests can enjoy the sun’s last rays.